Difference between revisions of "Silicondust HDHomeRun Dual"
Now you need to tell the HDHR to send IR commands to your frontend's IP via a specific port. Port 5000 is used below, but it can be set to any unused port. Just make sure you remember what you set it to because we'll be using that when setting up LIRC. Now you need to tell the HDHR to send IR commands to your frontend's IP address via a specific port. Port 5000 is used below, but it can be set to any unused port. Just make sure you remember what you set it to because we'll be using that when setting up LIRC. hdhomerun_config <device id> set /ir/target "<frontend IP address>:5000 no_clear"
The HDHomeRun, by Silicondust USA (a wholly owned subsidiary of Silicondust Engineering, New Zealand), is an external HDTV tuner for personal computers. It actually has two independent tuners, and interfaces to the computer via ethernet. The device is supported by MythTV (since v0.20), as well as many other PVR software packages. Since it tunes only digital signals (OTA HDTV as well as "Clear" QAM digital cable), which are already MPEG2 encoded, it has no MPEG encoding hardware. 7 Can't Connect to HDHR? SageTV - DVR for Windows. MediaPortal - DVR for Windows (beta). GB-PVR - DVR for Windows (beta). MythTV - DVR for Linux. Pluto - Home automation & media system. VLC - Multi-platform media viewer. If you are running an older version of MythTV you will need to upgrade to 0.20 (or later). Shortcut - if there is only one HDHomeRun on the local network you can use the wildcard FFFFFFFF device ID. The HDHomeRun (HDHR) is capable of forwarding IR commands via your LAN to LIRC. This can save you some money on purchasing an additional IR receiver for your frontend. However, the IR receiver is very directional and may require you to aim the remote directly at the HDHR. These instructions come from the Silicondust website. NOTE: Silicondust's website says that you can save the IR target to the HDHR's flash memory using the following command. I've had difficulty getting this to work, but here's the command. If this doesn't work either, you'll just need to issue the above command whenever your HDHR is unplugged and sometimes if your router gets reset. hdhomerun_config <device id> set /ir/target "<frontend IP address>:5000 store"
The last thing to do is to get LIRC listening for IR commands being sent from your HDHR. We'll kill any lircd processes first, just to be sure. Then we'll get LIRC listening on the proper port. We're using port 5000 again here, because that's what we told the HDHR to use. If you used another port, you'll need to specify that same port here. That's it. If mythfrontend is already running on your machine, you'll need to exit out of it and restart the frontend (just the application, not the computer) for it to work. Repeat for HDHomeRun Port 1. Note list of channels for source "Antenna"
Create an account here. The price is 20$/year with first 7 days free. Create a channel lineup and enable/disable channels based on channels listed in the Channel Editor in mythtv-setup. Note: you may find Scte65scan to be an alternative option that may more easily align channel numbers. Note list of channels for source "Digital Cable"
the display channel name and number in the Channel Editor in MythTV. Without that option you'll find yourself still missing guide data. For at least one user, the above set of steps solved the problem of getting 0 channels reported. The hdhomerun-config may be required for the scanner to work properly? You may have a firewall in the middle blocking traffic. If so, an easy solution is adding a firewall rule that permits all traffic to and from the HDHR. It is convenient (or maybe required for your OS flavor when using a GUI to edit the rules) to store this rule in an external file. For example, on Fedora, /etc/sysconfig/iptables-hdhomerun, and add a custom rule that refers to that file. The HDHomeRun normally expects to obtain a DHCP lease. However, with the latest firmware it is also possible to configure it statically. This is particularly convenient if you want to connect the HDHomeRun directly to a NIC on your MythTV system, rather than through a switch on your network. To do this, configure your local interface with a static IP address in the range of 169.254.x.x (eg. 169.254.1.10) with a subnet mask of 255.255.0.0 and no gateway. 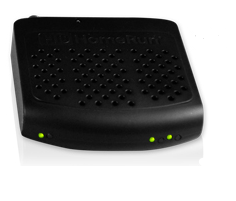 The HDHomeRun uses UDP to communicate to the backend. Since UDP is connectionless, it does not retry if a packet is lost. This can cause a problem with hubs, especially with multiple HD video streams and other traffic. Any collision on the network generally results in part of the video stream being lost. This shows up as random blocks in the video being corrupt, generally with colors that stand out against the video. Switches resolve this problem since they break up the network into more collision domains, although this problem will still appear if then network becomes fully saturated with traffic. When connecting to the HDHomeRun, it is recommended that you use the Device ID and not the IP address to specify the HDHomeRun to MythTV-setup. There may be an issue with in addressing the second tuner of the HDHomeRun, which will result in existing recordings terminating aburptly when the other tuner is accessed by MythTV. See #9247. Ensure that the HDHomeRun device is properly detected on the network using the hdhomerun_config discover command. If it is not, then resolve the connection issue before attempting to add the HDHomeRun in mythtv-setup. If things are configured correctly, the mythtv-setup program should automatically detect the device ID of the HDHomeRun when adding the tuner. In one case, although the IP of the HDHomeRun could be pinged from the MythTV machine, different netmasks between the MythTV machine and the HDHomeRun caused mythtv-setup and hdhomerun_config not to autodetect the device. Other causes might include a firewall on the MythTV box blocking access.